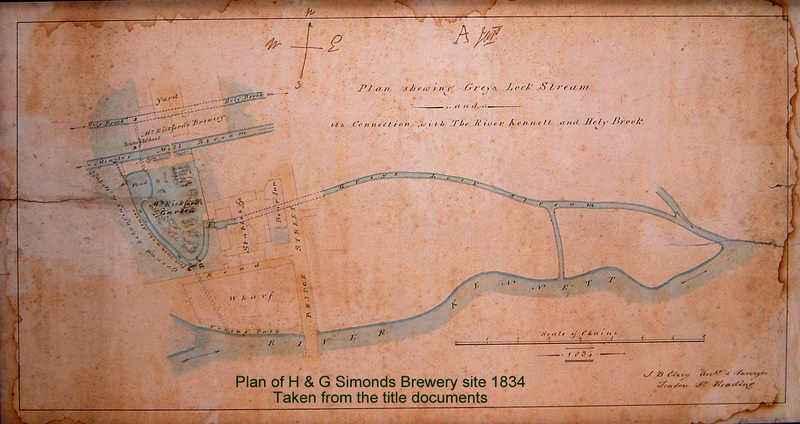 An original plan drawing of the brewery site. This is mounted on a wooden board and was in a framed display in Bridge Street for very many years. This is a map of the old Blandy & Hawkins’ Castle Street Brewer, which was Simonds’ biggest rival in Reading. It was bought by Hawkins & Parfitt’s Newbury-based South Berkshire Brewery in 1910 and then they in turn were bought by H & G Simonds in 1920 when it was closed down. It was generally called Blandy & Hawkins, but it actually changed names rather a lot with various partners. In 1834, It was probably Tanner & Hickford, although as Jonathan Tanner doesn’t seem to be mentioned on the map, perhaps he’d already left the business. The brewery was behind the owner’s house, 17 Castle Street – the finest (and one of the only) Tudor buildings in Reading. There are Solicitors in the building now.